This video of the crash of a Boeing 747-400BCF operated by National Air Cargo emerged on the internet shortly after the accident happened on April 29th. The National Air Cargo Boeing 747-400 freighter (N949CA) crashed on takeoff from Bagram Air Base, Afghanistan. As you can see in the video, the aircraft stalled and crashed from a low altitude and burst into flames. All seven crew members were killed in the accident. Of course, the cause of the crash is still unknown. Speculations go from pilot error, to shifted cargo or wrong loading. Before the airplane was converted to a freighter in 2010, it was in passenger service for Air France since it’s first flight in 1993. What do you think has caused this crash? Let’s discuss. Seems cargo shifting to me. I can’t see a microburst being strong enough to cause a nose up attitude like that. A performance increasing shear would certainly cause the nose to come up but wouldn’t necessarily cause a stall like that. The cargo flight N8-102 crew were heard on VHF air-band frequency reporting that some of the load of five heavy military vehicles weighing more than 70 tons in the cargo hold had shifted and﻿ the National Air Cargo Boeing 747-400 stalled. National Air Cargo Boeing 747-400 crashed and erupted into flames on impact. The crash site was near the end of the 11,849 ft long runway 03 within the perimeter of the Bagram airfield. All seven crew – Jamie Brokaw, pilot, Monroe, MI, Brad Hasler, pilot, Trenton, MI, Jeremy Lipka, pilot, Brooklyn, MI, Rinku Summan, pilot, Canton, MI, Michael Sheets, loadmaster, Ypsilanti, MI, Gary Stockdale, mechanic, Romulus, MI, Timothy Garrett, mechanic, Louisville, KY were killed on impact. The loadmaster performs the calculations and plans cargo placement to keep the aircraft within permissible center of gravity limits throughout the flight. Loadmasters ensure cargo is placed on the aircraft in such a way as to prevent overloading sensitive sections of the airframe and cargo floor. The loadmaster primarily supervises loading crews and procedures. Once positioned aboard the aircraft, the loadmaster ensures the cargo is secured against movement. Chains, straps, and integrated cargo locks are among the most common tools used to secure the cargo. Because cargo may shift during abrupt maneuvers, the loadmaster must determine the appropriate amount and placement of cargo restraint. There are many things that could go wrong. If it was palletized, a lock could of failed. A chain holding the vehicle might of been weak and broke. Or a tiedown could of failed. There are many things that could of happened to cause the high nose pitch. Cargo shift is a high probability. Center of gravity on an aircraft is very important, especially on cargo planes. 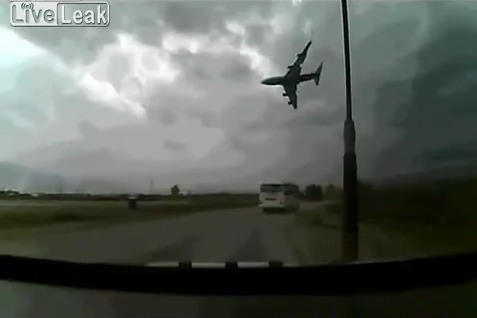 Watching the video makes me think that the cargo load got loose and shifted back and caused the rapid nose high pitch. It´s a very deep stall because the aircraft seem to be almost vertical in the rolling. Similarly August 11, 1997, a Fine Air DC-8 aircraft loaded with 45 tons of fabric, departed Miami International airport, just moments into its flight the DC-8 came tumbling down killing at least 5 people. The DC-8 upon takeoff became tail heavy, stalled and then crashed in a Miami, business district just several hundred feet from the runway. Investigators have recovered several cargo latches from the DC-8 and it has been reported that only one of the latches was in the locked position. This would indicate that the cargo on the DC-8 upon takeoff had shifted to the tail off the aircraft making it tail heavy producing an uncontrolled sharp nose up in the rolling.